The word ‘chakra’ is a Sanskrit word that means literally ‘wheel’. Those who can see the energy of the chakras perceive them as wheels or vortices of energy. There are seven main chakras and hundreds of minor ones in the body. The seven main chakras are situated at the crown, the brow, the throat, the heart, the solar plexus, the navel and the base/root. Each of the chakras governs or affects the glands and organs situated in that part of the body. Each one has a colour relating to the frequency of the energy in that part of the body following the same lines as a rainbow. The crown is violet (or clear), the brow is indigo, the throat is light blue like the sky, the heart is pink and green, the solar plexus is yellow, the navel is orange and the base is red. When we are completely well physically, mentally, emotionally and spiritually all the chakras spin at the right speed for you and the colour is clear and free from any patches or spots. Our bodies operate using electromagnetism; this is how our brain sends messages to all parts of us. The mechanism for healing is by the sending of the electromagnetic pulses throughout the body and on a day to day basis the body is healing itself. When we are well all the energetic system is working properly too. The energy flows in and out easily and every cell is in perfect order. If we are unwell in any way our energetic system is also out of balance and this can be felt or seen in the chakras and also in the aura. Until very recently scientists considered that the electrical force in the human body did not create enough energy to have a magnetic field sufficiently large to have any affect. This, of course, rather goes against the general scientific principle that suggests that if it exists it must do something. Now that instruments have been developed that enable this force to be measured and the aura can be photographed it is more widely accepted that humans, and all other living things have an aura or electromagnetic field around them. 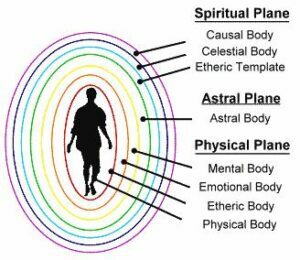 The field is created by the workings of the body generally but also affected by our thoughts and emotions as these are also electromagnetic pulses. In this way are feelings and thoughts sit within the auric field. When we do not deal with these it is like they get stuck in the field and gradually build up and over a period of time can result in physical illnesses in the area affected. When we are well the auric field and its colours are clear and without any dark patches or dullness. The extent of the field varies from person to person. You can look at the field as in some ways representing your ‘privacy zone’ as when someone uninvited or unwanted enters your auric field you can find it very uncomfortable. Equally when you are with someone very close to you when you stand near to each other yours auric fields can join and blend. The colours that can be seen in the auric field can be described in two ways. Firstly there are the normal colour psychology interpretations and this is generally what is used when you have an aura photograph taken, and secondly the colours as seen by healers or psychics who are able to psychically see/sense the auras. Often the colours seen by these two methods differ but the meanings will generally agree. The chakras feed out through the aura and each of the chakras link with a particular level of the seven levels of the auric field. It is through this link that energy from the aura feeds in and out of the chakras. So when dealing with physical illness it is also necessary to look at the other aspects of the self and deal with issues there to fully heal.